Bovada has a poker room to go along with their casino, sports, and horse betting operations. Bovada is a sister website to the world famous Bodog site, owned by the Morris Mohawk Gaming Group. BovadaPoker is licensed in Kahnawake and uses RealTime Gaming software for most of their game needs. Supplementary software is powered by DGS and the Bodog proprietary brand technology. 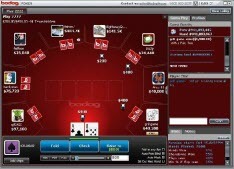 Bovada Poker opened in 2006 and continues to accept US players. Best tournaments at Bovada Poker. Bovada offers five poker variants for players to enjoy: Texas hold'em, Omaha, Omaha hi/lO, 7-card stud, and 7-card stud hi/lo. Each game offers its own challenge, drawing in completely different poker crowds. Each game offered has its own set of variables, so you can play at the bet limits you feel most comfortable playing at. I'll cover each game in its turn. Texas Hold'em is the most popular version of poker in the world right now. Texas Holdem is the game played at the World Series of Poker Main Event. If you watch televised card matches, you're probably viewing Texas hold'em. The great majority of the famous professionals made their name playing Texas Holdem, either in cash games in private casino poker rooms or in World Poker Tour, European Poker Tour, and Asian Poker Tour events. This is the game where a player is given two cards and is required to build a hand with those cards and 3 of the 5 community cards which are eventually dealt. The communal cards can be used by everyone at the table. Texas holdem is played in pot-limit, fixed limit, and no-limit forms. Omaha looks a lot like Texas hold'em at first glance, because it uses the same number of community cards. The game provides players with four dealt cards instead of two. Players have to make a 5-card hand with 2 of their 4 dealt cards and three of the cards on the board. Omaha requires a player to see more possibilities and tends to punish the player who plays weaker hands. The hi/lo version of the game offered by Bovada pays equal amounts for the best high hand (like traditional poker) and the best qualifying low hand. This provides yet another layer of intrigue to an already intriguing game. Seven-card stud attracts players with an iron will, because less is revealed when the bulk of betting starts than in hold'em games. To begin a hand, players are dealt two face-down or hole cards, along with one face-up card. The first round of betting occurs. After this round transpires, players are given an extra face-up card apiece until everyone has 7 cards. Players must build the best 5-card hand possible, with five successive rounds of betting if 2 or more players decide to bet all the way to the showdown. The entire equation can be upset by any card dealt, requiring players to be more calculating and cold-blooded then their Texas holdem counterparts. Once again, a hi/lo version of the game is offered at Bovada, which adds another dimension to their calculations . Bovada offers $5,000 Weekly Freerolls under the heading of their current "NFL Poker Pass" promotion which gives people a chance to win a trip to Super Bowl XLVII in New Orleans. Every week throughout the National Football League season, you can enter free roll poker tournaments. Winning these tournaments enter you into $2,500 and $5,000 freerolls. Winners also have the oppurtunity to win a $15K Super Bowl prize package. This package includes flight and hotel accommodations for two people, $500 in spending cash, and two tickets to Super Bowl 47, which is held in the New Orleans Superdome. The $100K Guaranteed is a poker event held every Sunday at 4PM Eastern Standard Time. The prize pool is always at least $100,000. Satellite qualifiers allow entry into the tournament for as low as one dollar. Players can use poker points to enter, or simply buy their way into the event. First prize is $20,000 minimum, while second price is $13,000 min and third place is $10,000 minimum. Those new to poker might need some background on the UIGEA law, because it affects players and poker operators around the globe. The Unlawful Internet Gambling Enforcement Act is a liberal anti-gambling statute which was written in 2006 by conservative American lawmakers to keep online gamblers based in the USA from enjoying poker and other betting from the privacy of their own homes. This law greatly expands the power of the U.S. government to invade the privacy of its citizens, though the law has been challenged in WTO courtroom and was found to be out of line with international law. Players from most European countries are welcomed to Bovada, though real money gamblers from France cannot play at the site. Bovada has a lot of loose players, because the web address has a casino, sportsbook, and horse betting operation on-site. That means gamblers who don't consider poker as their best game are more likely to navigate to the virtual poker room and play some cards. One reason you should engage card players in live chat is to determine whether they are serious poker players or just casual gamblers looking for some entertainment. Much of the time, you'll find Bovada offers poker players who give you opportunities to rake up a lot of money.